It bolts to a custom axle which is a straight axle with splines on each end and with threads for a standard GM 33MM nut on each end. 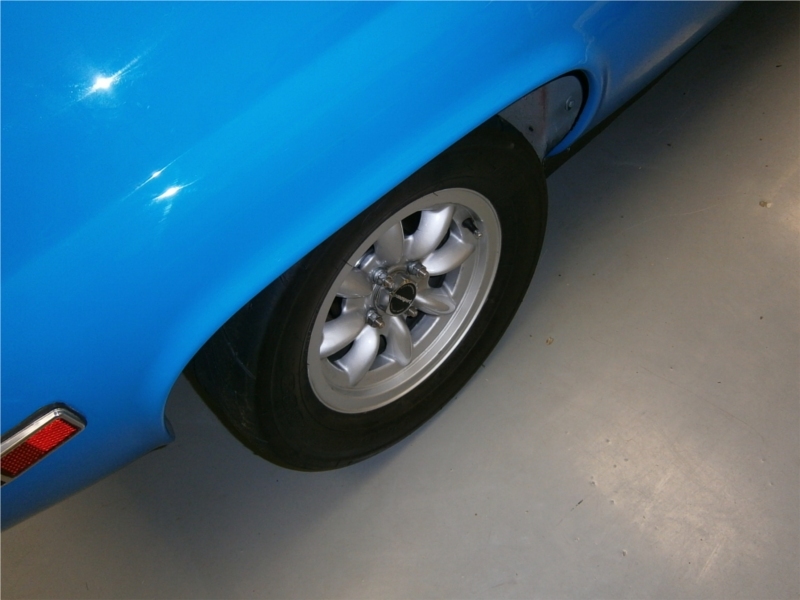 The axle is straight except for a 1cm-long bump which is located outside the outer wheel bearing. The outer wheel bearing is stock. The inner wheel bearing is a dual-row ball bearing that fits in the original Lotus upright without change. A spacer (not pictured) between the two bearings (bearings not pictured) provides the load path. The above shows, top to bottom: The new rear axle complete. Then a 15 inch scale. Then the first version of the axle. Then the original stock Europa axle (in the stock case a washer and a 3/8 inch spacer were left out of the picture by accident). I misplaced one of the washers in the picture (good grief). The new-axle washer pictured at the left really goes between the outer hub and the nut at the far right. The washer pictured at the right goes over the splines and is captured between the hub and an area of the inner race. The raised area just right of the right-hand (as the new axle is pictured) bearing area bears against the inner race too. Unfortunately the old-axle is oriented backwards in the picture, I should have put its ujoint end at the left to match the new axle. I weighed the parts pictured and the original axle weighs 5.5 pounds and the new axle weights 7.5 pounds. So there is a price to be paid in having the extra steel. The brass-tone 'first version' was on the car for a few years and somehow the inner end broke off. We don't understand how or why, though I now suspect severe over-torque in my effort to align a hole in the axle with the castellated nut to put in a split-pin. Nothing was harmed and indeed multiple track days happened with the broken-off-nut (as soon as I understood it was broken the car was taken off-road and the new axle was made). New axles were finished in May 2011 (the gray-tone uppermost axle in the picture). The wheel studs pictured above are 1.9 inches long under the head, 12x1.5 metric from Jon Wolfe Racing in the UK, a Spitfire racer. I had to remove a little metal from a side on the flat head to make it fit, but that was easy. They were not Land Rover Freelander studs (Part CLP9037L): the Freelander studs (2 inches long) have a tapered thick end (hub end) like Europa but Jon Wolfe's had a flat thick-end surface. The Land Rover studs look like a good option for some people though. An option is 2 inch 12mmx1.5 from NAPA (studs 641-2792, acorn chromed nuts 641-2139, open end nuts 641-2040) according to Briggs P on the Europa email list 28 Aug 2011 -- these seem to match the Freelander wheel stud dimensions. 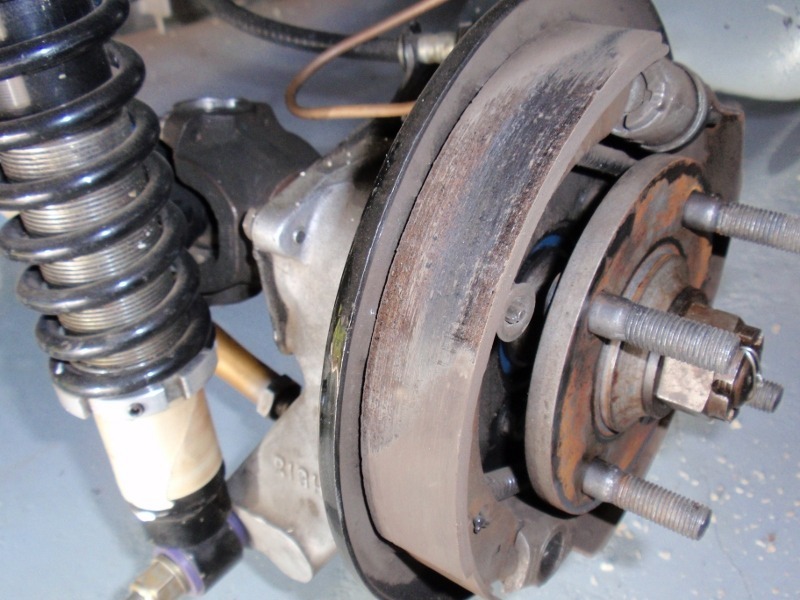 In July 2011 after new rear disk brakes installed (and a spacer was added so the wheels fit over the caliper) I wanted longer studs so the wheel nut was fully engaged. I found ARP part number 100-7708 (also M12x1.5) at Gotelli's in South San Francisco (California), a local speedshop. These fit perfectly in the original holes (no taper at the thick end, but that seems irrelevant in practice). These are 2.5 inches overall under the head. They were designed for some Corvette and Camaros. ARP are currently the makers of the very best bolts. With the wheel mounted, the studs stick out nicely, per the following picture. The following picture shows the bar I use to hold the hub to tighten it to 150 foot pounds. 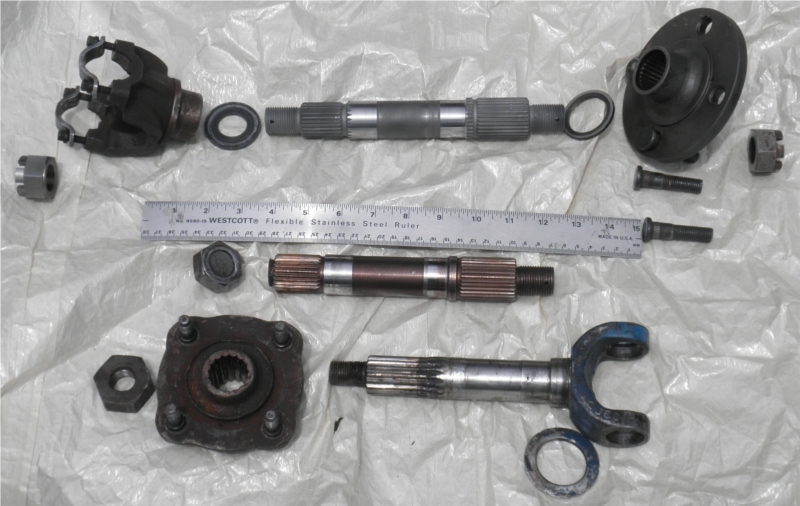 Because the upright inner flange is secured to the ujoint with removeable steel standard steel ujoint straps the upright and bearings can be separated from the hollow driveshaft easily. The ujoint straps and screws are available at any US parts store and inexpensive. The 'bump' on the axle outboard of the outer bearing means the inner large nut holds the ujoint holder all the way through to the outer bearing inner race as a solid assembly. The outer hub has a recess machined to fit snugly over the bump on the axle. So when the outer nut is tightened there is no rocking possible in any direction, the outer nut just holds the outer hub (and must me tightened last). Hope the above makes sense. It all means that removing the drive shafts completely is simpler than with stock, simplifying engine/transmission removal. Because the flange on the transmission side of the upright extends a bit further than the stock item and because the ujoint is GM not Europa size a driveline shop shortened the axle a bit and welded on the GM flange. 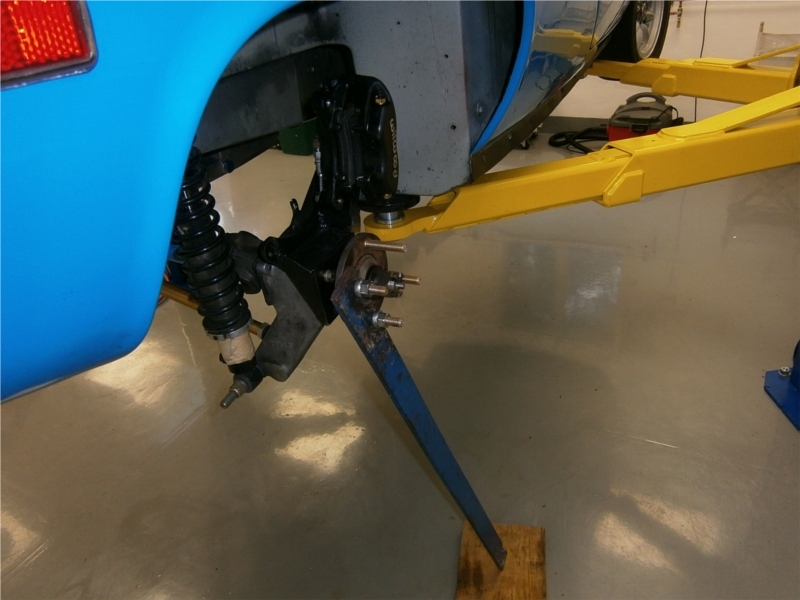 Thus the original overall placement of the rear radius arm is unchanged from stock. Some research on the web indicates some part numbers. You may find www.dennysdriveshaft.com to be of interest (I did), they arrange things by size, not model year (handy as no meaningful model year information is possible here). The following is believed accurate, but accuracy cannot be guaranteed. The ujoint is Spicer 1310 series (marked on my ujoint as SPR 529). Apparently 1310 is a common industry designation. The yoke is Dana 7290 series 30 spline, the assembly is Dana PN 2-4-7651-1X and Spicer P/N 2-4-7641-1 (per Dana Catalog J300P-4C.pdf). The yoke casting is marked SPICER 783. The spline count: 30 splines. Still looking for hub information. 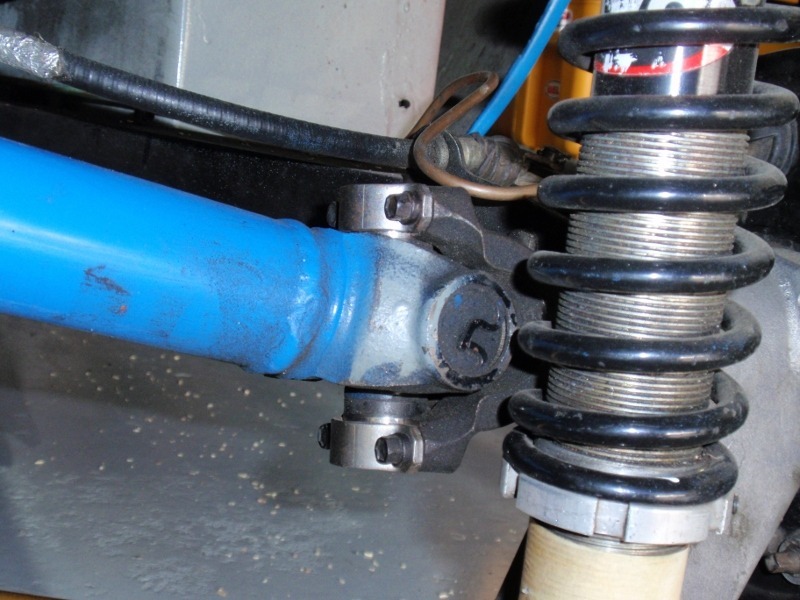 Any axle shop that can shorten the driveshaft on each side of the transaxle should have the yoke to weld in, since the new outer ujoint size is a common size. The inner yoke was left unchanged from stock TwinCam at U-100 size. The outer ball bearing is stock. The inner ball bearing is stock ID and OD but 2-row and double-wide. The designation has been lost (as said above), which is unfortunate. The bearing-spacer inside the hub is stock dimensions, but thicker and better steel than the original, and fits the axle a bit more closely than the original. For long M12x1.5 wheel studs, ARP 100-7708 are a good choice as they fit in the original hub stud holes.